We’ve all heard the expression ‘A picture is worth a thousand words’ and the Russian writer Ivan Turgenev wrote in the book “Fathers and Sons” in 1862, “A picture shows me at a glance what it takes dozens of pages of a book to expound.” The same can be said of a good map, especially when it’s a map that you’ve created showing you exactly what you want to know. For example, I was recently asked by a client, who is planning to relocate their business, to provide a map which showed them where they were currently located, where their competitors were located and where their employees were located. They also wanted to be able to view which of these was located within a 10 mile, 20 mile and 50 mile radius of their current location. By having a visual representation of all these factors it helped them to decide which area they should focus on when looking for suitable relocation premises. To complete this task I used Google My Maps Pro because it provides a powerful tools for custom map creation, collaboration, and sharing. Note: Google My Maps is free for everyone and intended for personal use. My Maps Pro adds additional features and capabilities and is a paid product that individuals, organizations, and businesses can use. Use different colours to make parts of your map stand out. Label your features directly on the map. Organise your places with layers. Here we work through a fictional example where the Queen is thinking of relocating from Buckingham Palace to one of the other Royal Residences but would like to remain within 15 miles of Kensington Palace so that she can easily visit her grandchildren. In Google Maps click on create a map. Enter the address in the search box – in this case for Kensington Palace. Click on the marker and select add to map. This will then add your marker as a layer to your map. You can give your layers titles by clicking on ‘untitled layer’ and entering an appropriate title. Now that we have a central point we can start building on it. Click on ‘Add Layer’ – you can now add places to this layer by drawing or importing data. For My Maps, which is free, you can upload up to 500 features per layer. For My Maps Pro, you can upload up to 2,000 points or rows. You can import CSV, TSV, KML, or XLSX files, classic My Maps, or spreadsheets from Google Drive. Note: KMZ files aren’t supported and you can only import one type of data file per layer. In this example we are importing a CSV file. When you have completed your spreadsheet and before you start your import make sure the correct layer on your map is selected in blue in the legend on the left. Click Import. Drag a file from your computer, select a Google Drive file or open a previous My Maps map. Pick one or more columns that identify the location of your data. Pick a single column to label the data on the map, then click Finish. Markers will now appear on the map depicting the locations in your spreadsheet. One of the strengths of My Maps and My Maps Pro is the ability to style your data in smart ways so that you can easily identify what your different markers are. You can also choose to display labels for any feature directly on the map for easy browsing. In this example we have changed the royal residence markers to yellow stars. You can select from different colours, icon shapes, and line widths. You can also choose from a large set of fun icons by clicking the More icons button. With My Maps Pro, you can choose from an even larger set of icons, or add your own custom icons for place marks. To create the radius there is a nifty website called Free Map Tools (http://www.freemaptools.com). Here you can find free tools to allow you to measure, save and send maps to other people. To find the radius around a point on the map. First search for your location in the search box. 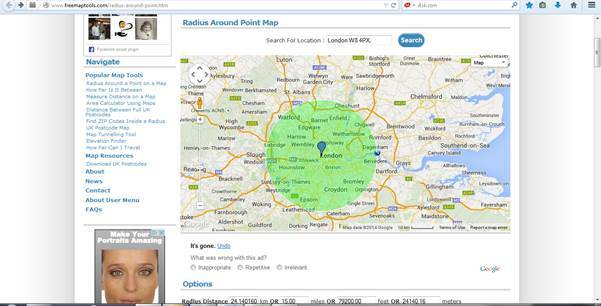 Then type in the radius required in kilometres or miles and next click on the map at the centre of where you wish the circle to appear. You can now export the drawn radius to Google Maps. Note: do not edit the shading and line colour and thickness in my free map tools as this will not transfer to Google Maps. You will be able to do this later in Google Maps. Once ready, click the Generate KML button. You will probably need to scroll down the page to find this! Click the hyperlink to download the KML file to your computer. Choose the file and the radius will appear on your map. You can now edit the radius line and shading by clicking on the edit button to the right of the word ‘polygon’. When you have finished adding all of your layers you can view as many or as few of the layers as you wish by checking or unchecking the box to the right of the layer name. Finally you can now share your map by clicking on the Share button. After giving your map a title a link will be generated and you can send it as view only or view and edit via Gmail, Google +, Facebook or Twitter. And in case you were wondering …. The Queen decided to stay at Buckingham Palace as it turned out to be the perfect location for her needs and besides she didn’t think Philip’s back could take moving all of her furniture! Anne Higham is a project manager and experienced VA at Outhouse-UK. 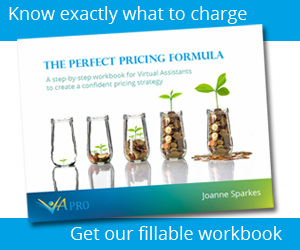 Often involved in project planning and process mapping, she loves to help her clients stay organised and use the latest technology to get great results for their business.